Special Offer. Buy 6 Bottles for £45.00 each. Save £30.00 !! A yellow colour with golden glints and a crystal-like brilliance. Fine bubbles that rise in an airy, long-lasting line. The palate is perfectly balanced and fresh with an extremely long finish. 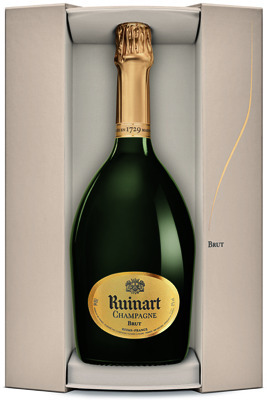 Ruinart R de Ruinart Brut NV is created using a precise blend of exceptional grapes. It is made of 40% Chardonnay from the Cotes des Blancs and 60% Pinot Noir from the Montagne de Reims. Ruinart R de Ruinart Brut NV is excellent on its own as an aperitif or ideal for an all-champagne meal. Also perfect with delicate dishes such as pan-fried scallops or sole meuniere.